Tang Dynasty. Emperor Xuanzong. Cockfighting. Qingming Festival. 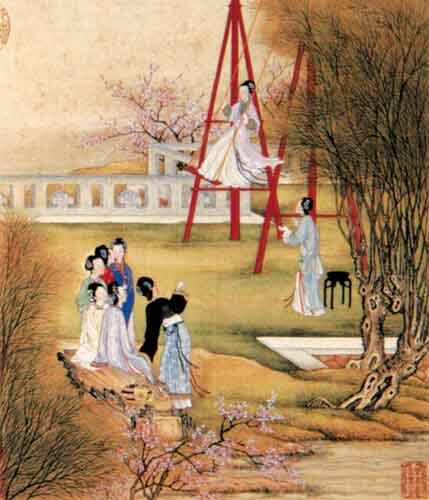 Apart from the activities of Qingming Festival that are still celebrated in modern times, including paying respect to ancestors, sweeping tombs, flying kites and family outings, there were many interesting activities and entertainments in ancient times to celebrate this festival. 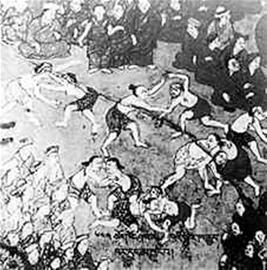 It is said that during the period of Spring and Autumn in ancient China, the Duke of Chu ordered their people to play the game of Qian Gou (牵钩)/tug-of-war to improve their physical quality to prepare for attacking Wu. And the game of tug-of-war is still very popular in modern times. It’s a game of practicing archers’ skills. According to records in Ming dynasty, the game was played by putting pigeons into gourds and hanging them in willow trees. Then, archers would shoot the gourds to let pigeons fly out and deciding win or lose due to the height of pigeons’ flying. 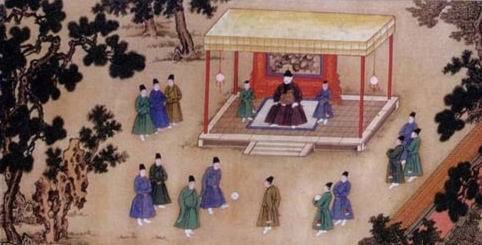 Cu Ju (蹴鞠) is the former form of football, and it started during the Shang dynasty in ancient China. The ball was made from leather and filled with fur and feather The game entered civilians’ lives since Warring States, became a fitness form among military soldiers in Han dynasty and got very popular among average people in Tang and Song dynasty, but there are few records of this game being played during the Qing dynasty. 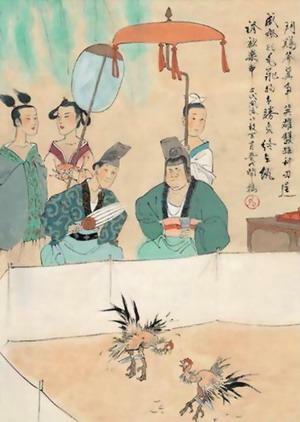 The cockfighting was a very popular activity in ancient China. 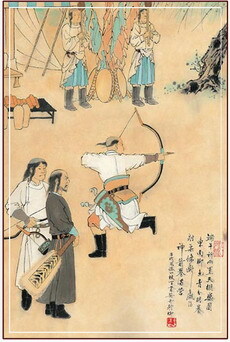 People usually did cockfighting from the Qingming to the Summer Solstice (solar term in Chinese lunar calendar). In Tang dynasty, cockfighting was very popular both among civilians and royal families. It is said that Emperor Xuanzong was a huge fan of this game. The game was originated very early and primarily among girls. It was very popular since period of Northern and Southern dynasties, and more popular among both boys and girls in Tang dynasty. It is said that playing on a swing could eliminate diseases. Moreover, the higher one plays, the happier his life would be. The Qingming or Ching Ming Festival, also known as Tomb-Sweeping Day in English, is a traditional Chinese festival on the first day of the fifth solar term of the traditional Chinese lunisolar calendar. This makes it the 15th day after the Spring Equinox, either 4 or 5 April in a given year. Other common translations include Chinese Memorial Day and Ancestors’ Day. The Tang dynasty (Chinese: 唐朝) was an imperial dynasty of China (618–907) preceded by the Sui dynasty and followed by the Five Dynasties and Ten Kingdoms period. It was founded by the Lǐ family (李), who seized power during the decline and collapse of the Sui Empire. The dynasty was briefly interrupted when Empress Wu Zetian seized the throne, proclaiming the Second Zhou dynasty (690–705) and becoming the only Chinese empress regnant. The Tang dynasty, with its capital at Chang’an (present-day Xi’an), which at the time was the most populous city in the world, is generally regarded as a high point in Chinese civilization, and a golden age of cosmopolitan culture. Its territory, acquired through the military campaigns of its early rulers, rivaled that of the Han dynasty. In two censuses of the 7th and 8th centuries, the Tang records estimated the population by number of registered households at about 50 million people. Yet, even when the central government was breaking down and unable to compile an accurate census of the population in the 9th century, it is estimated that the population had grown by then to about 80 million people. With its large population base, the dynasty was able to raise professional and conscripted armies of hundreds of thousands of troops to contend with nomadic powers in dominating Inner Asia and the lucrative trade routes along the Silk Road. Various kingdoms and states paid tribute to the Tang court, while the Tang also conquered or subdued several regions which it indirectly controlled through a protectorate system. Besides political hegemony, the Tang also exerted a powerful cultural influence over neighboring states such as those in Korea, Japan, and Vietnam. The Tang dynasty was largely a period of progress and stability in the first half of the dynasty’s rule, until the An Lushan Rebellion and the decline of central authority in the later half of the dynasty. Like the previous Sui dynasty, the Tang dynasty maintained a civil service system by recruiting scholar-officials through standardized examinations and recommendations to office. This civil order was undermined by the rise of regional military governors known as jiedushi during the 9th century. Chinese culture flourished and further matured during the Tang era; it is considered the greatest age for Chinese poetry. Two of China’s most famous poets, Li Bai and Du Fu, belonged to this age, as did many famous painters such as Han Gan, Zhang Xuan, and Zhou Fang. There was a rich variety of historical literature compiled by scholars, as well as encyclopedias and geographical works. The adoption of the title Tängri Qaghan by the Tang Emperor Taizong in addition to his title as emperor was eastern Asia’s first “simultaneous kingship”. There were many notable innovations during the Tang, including the development of woodblock printing. Buddhism became a major influence in Chinese culture, with native Chinese sects gaining prominence. However, Buddhism would later be persecuted by the state, subsequently declining in influence. Although the dynasty and central government were in decline by the 9th century, art and culture continued to flourish. The weakened central government largely withdrew from managing the economy, though the country’s mercantile affairs stayed intact and commercial trade continued to thrive regardless, at least until agrarian rebellions in the latter half of the 9th century brought the dynasty to its knees, resulting in damaging atrocities such as the Guangzhou Massacre. Emperor Xuanzong of Tang (8 September 685 – 3 May 762), also commonly known as Emperor Ming of Tang, personal name Li Longji, also known as Wu Longji (Chinese: 武隆基) from 690 to 705, was the seventh emperor of the Tang dynasty in China, reigning from 712 to 756. His reign of 43 years was the longest during the Tang Dynasty. In the early half of his reign he was a diligent and astute ruler. Ably assisted by capable chancellors like Yao Chong, Song Jing and Zhang Yue, he was credited with bringing Tang China to a pinnacle of culture and power. Emperor Xuanzong, however, was blamed for over-trusting Li Linfu, Yang Guozhong and An Lushan during his late reign, with Tang’s golden age ending in the Anshi Rebellion. This marked the beginning of the Tang dynasty’s decline. Previous Post Han Dynasty. Emperor Cheng. Cockfighting. Next Post Qing Dynasty. Cockfighting. Guangzhou Museum.